An in Depth Review of BetOnMarkets + 25% First Deposit Bonus! Betonmarkets was launched as one of the first binary options platforms 2009, which is underscored by its various gambling commission licenses, i.e. no FSA license etc…It is also one of our staff writer’s favourite binary options sites (hence why many of his binary option strategy articles contain screen shots of the BetonMarkets.com software). Sign up to Betonmarkets Now and receive $20 Free! Account opening bonuses to the tune of 25% of account size are given to first-time traders on the Betonmarkets platform. After opening an account online, traders are required to fund their accounts with a minimum of $5. Minimum trade amount is only $5 per trade. Betonmarkets is one of the very few binary options brokers that provide traders with an unlimited demo account facility. Traders can practice all forms of binary trading for an infinite amount of time before they open trading accounts. In essence, you do not need to be an account holder to open a demo account. Betonmarkets offers a web-based platform that can be used to trade a wide variety of assets. Some of the trading varieties such as the High/Low trade have sub-varieties that provide even more opportunities to make money if the trader knows how to utilize them. Order placement is very easy and the platform display enables traders to know the exact costs of their trades as well as the potential payouts. Payout is between 70% and 350% depending on the trade type and the asset traded. A feature of Betomarkets hardly found anywhere else is that they do a trade analysis of recent bets and payouts so that traders can generally get a direction of market bias for the day. New traders can also register for a special educative webinar on how the binary options markets work. 1) Currencies: EURUSD, USDCHF, USDJPY, AUDUSD, GBPUSD and the Yen crosses. 2) Stocks: Apple, Bank of America, Caterpillar, Citigroup, COCA COLA, Google, McDonald’s, Microsoft and Pfizer. 3) Commodities such as corn, coffee, sugar and copper, gold and silver. 4) Stock index futures such as the Xetra DAX, DJ30, NASDAQ100, S&P 500 and Nikkei 225 futures. Traders can trade the following binary options types on Banc de Binary’s web-based trading platform. d) Rise/Fall: Betonmarkets is one of the few binary options brokers that offer the Rise/Fall variety of binary options, with very quick expiry times that are as low as one minute. Betonmarkets also offers a variable/flexible binary option facility where traders can close trades manually before expiration to either cash in on profits or curtail losses. Another great innovation from Betonmarkets is the weekly newsletter, which is sent to all live and demo account holders. This newsletter exposes potential trade opportunities and can greatly enhance a trader’s knowledge of the binary options market. Betonmarkets provides a good customer service support system. They can be reached by live chat, email or phone. 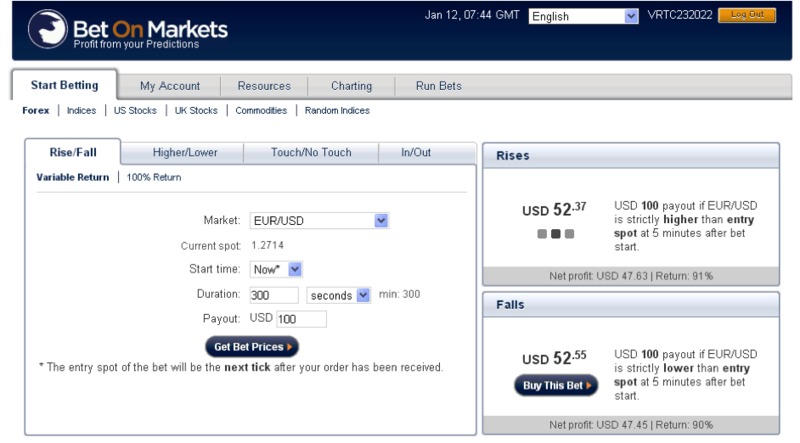 BetOnMarkets is one of the pioneers in binary options trading and was established early in 2009. They are among the prominent names in the industry and are based out of the British Virgin Islands. In addition to this, they have several other offices in Australia, U.S., Indonesia, and Russia. BetOnMarkets is famous for its incredibly low deposit that starts at $5. They offer several modes of banking to facilitate easy deposit and withdrawals. They offer a wide variety of payment gateways for easy transactions. The support staff at BetOnMarkets is excellent and highly knowledgeable. They have an excellent track record for their response time. One of the beauties of the Betonmarkets platform is the limitless demo account facility that gives traders many opportunities to thoroughly practice trades. This is an extremely beneficial facility as traders who trade binary options with other brokers can actually use the Betonmarkets platform for their trading practice. A potential downside is the lack of a mobile trading platform application, but knowing how fast innovations come up these days, it will not be long before we see the Betonmarkets platform suite available for smartphones and tablet devices.